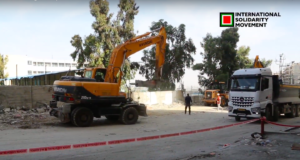 The Israeli military demolished three water cisterns and two wells in the Khashem Ad Daraj – Hathaleen region on Tuesday, December 14th . The military gave no reason for the destruction of the wells and cisterns. 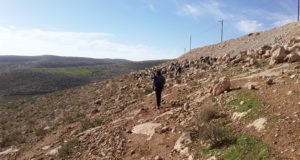 The demolitions follow a pattern of destruction of Palestinian property by the Israeli military in Area C, as defined by the Oslo Accords. 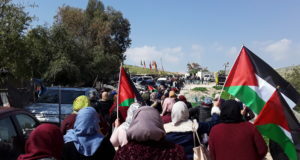 Rather than delivering the demolition orders to the residents of the villages in the area, the Israeli army instead left the orders under a stone two days earlier. The demolished cisterns and wells supplied drinking water to the villagers as well as their sheep and goats. The wells were up to 300 meters deep and over 70 years old, pre-dating the 1967 occupation of the Palestinian Territories. International Humanitarian Law and Israeli Military law state that structures created before 1967 are protected and not to be destroyed by the occupying power. The villages are in the southern West Bank, less than 15 km from the Dead Sea. This hilly region is arid, and receives an average yearly rainfall of between 150 – 250 mm. Shepherding of sheep & goats is the primary source of food and income for the villages in this area. The destruction of the water wells & cisterns directly impacts their livelihood.